Ramstein couldn’t turn back the hands of time and replay last season’s tight championship game loss to Stuttgart, but they got a slight measure of revenge with last weekend’s 41-19 win over the Panthers. The teams traded scores in the first quarter but it was 25-6 in favor of Ramstein by halftime. 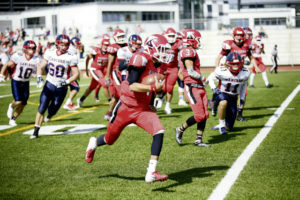 The win came after Ramstein had blanked Stuttgart in the junior varsity game, 18-0, and it was Senior Day on the RHS campus, creating a memorable afternoon for the program. Dominique Arizpe and Naser Eaves had touchdowns, the second one coming after quarterback Jakob Steinbeck passed to Drew Hodges and Jason Jones for key first down pickups. Carl Norman had a big catch and run to set up the next score — on a TD catch by Jones — then Eaves and Arizpe scored again to create a wider lead. “It really shows the depth of Ramstein, how we have such consistency throughout our depth chart and we are able to plug in whoever we need whenever we need them,” senior quarterback Steinbeck said after going 12-of-18 passing for 158 yards. Eaves had three touchdowns on five receptions, playing well also in the defensive backfield with other RHS skill players. Jalon Lewis and Jones each had an interception and the stiff Royals defense was paced by Bailey Holland, Katroy Wright, David Faust, Kyle Lloyd, Cole Strom, Gabe Davis, Logan Ridenbaugh, and several other contributors. Instrumental at both defensive back and runner, J.J. Little turned in another fine game. He combined with Arizpe for 175 rushing yards and three touchdowns. Junior defender Strom had a quarterback sack, a forced fumble and eight tackles. Holland and Lloyd each had six stops and the interior line play, led on both sides by All-Europe senior Nick Scherzer, was one of the defining aspects of the contest. The KHS Raiders built a 31-9 lead on their home field last week but allowed Lakenheath to come back and get a 46-31 win. Seniors Corey Coombs and Solo Turgeon joined quarterback Esteban Saldana in producing some highlight-reel material, but Lakenheath had a running back or two of their own who were equally noteworthy. Coombs had nearly 200 rushing yards and Turgeon paired with Raider Cedric Ellis in mounting a serious threat at scoring the upset. 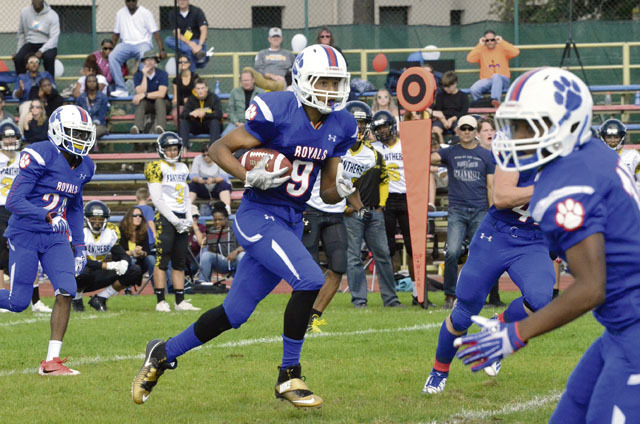 The Raiders play at Wiesbaden this weekend and Ramstein plays at Vilseck.